I did BabyGym with my firstborn and was so glad to hear that Rentia was still involved with the programme when my second was born. Rentia truly has a wonderful way to present the classes and her passion for the programme and whole brain development is clearly visible. She is always willing to share her knowledge and experiences and gives practical advice on how to implement the guidelines in daily routines. I will surely recommend her classes for all new moms. Rika is very knowledgeable. I would not have known how to play with either of my children if it wasn’t for BabyGym - it is wonderful to know we are playfully developing our baby’s brain. Love Rika! Whenever I have questions, Rika is always there with advice and exercises. Daneke is an awesome instructor! She is caring, kind, patient and genuinely interested in my baby’s development. I love how she used her own experience with her sons as examples. My baby, Alné, is now calm and relaxed and had her best naps after a BabyGym class. She is all smiles when she realises it is time for her BabyGym massage every evening before bath time! BabyGym gave me, as a working mother, the skills to use the limited quality time available to combine play with activities which would have a beneficial impact on my baby’s development. I would definitely recommend anyone to attend BabyGym with Daneke in Tzaneen. "Thank you so much Lelani! BabyGym meant so much to me and to Milea. Everyday is filled with activities now, and I enjoy this little baby even more. Lelani, you are a very special person! I feel blessed to have been able to do BabyGym!" "Anneri is so thorough and passionate about what she is imparting on us. She is absolutely fantastic at what she does. Even my baby as small as he is was eye locked on her and he loved her voice. Everything about her way of executing the class from explaining to demonstrating to interaction etc is phenomenal. I learnt so much. She makes you feel like you have made a friend in her. Joshua and I will definitely miss our classes with her. Thank you for the most fun experience of bonding and learning! "Dit was so 'n ongelooflike lekker en leersame ervaring om BabaGim by Nita te kon doen. Sy het met elke klassie soveel moeite gedoen. Haar passie en entoesiasme vir dit wat sy doen is so verfrissend en aansteeklik dat ek elke keer so geinspireerd daar weg gestap het en opgewonde was om die BabaGim-oefeninge by die huis te gaan toepas.Nita is 'n absolute aanwins en ambassadeur vir BabaGim." “Our instructor, Christine, was spectacular! She gave us so much insight and answered all our questions. She is always willing to help, she goes over and beyond our expectation. She is a wonderful instructor, and I will recommend her and BabyGym to everyone I know." "I have only good things to say about Christine, her love, passion and enthusiasm for what she does is evident from the beginning of the first BabyGym class, and it carry’s on right through to week 5! This makes you feel comfortable to ask any questions especially about challenges you may be facing with your little one. She answers questions with great knowledge and advise, helping you to understand the growth process happening inside your baby. I’m actually sad the program is over but I am looking forward to implementing this into my baby’s lifestyle every day. Thank you Christine!" "I am a mother of 2 children, after my first child you think you know most of the important stimulation techniques. I was pleasantly surprised and grateful that I have joined BabyGym! I have learned so much and I can notice how my baby is getting stronger every day! Thank you Christine and BabyGym for guiding me on this amazing journey." "This was a special experience where mother and baby could connect and strengthen their bond. It was also lots of fun to show Dad what we did in class and to empower him to do the activities with us after work and over the weekends. This made family time so much more special. We can’t wait for the next class and will definitely recommend BabyGym to friends and family." "Overall excellent! I love BabyGym and I love Anneri!" “Rika was wonderful and I am looking forward to doing more BabyGym classes with her! My little one was struggling with constipation and Rika spent some extra time to assist me with the colon massage. Meghan and I really enjoyed the BabyGym classes! "Attending BabyGym was a wonderful experience and I do wish that all new mommies and babies can attend this program. I never thought about what an impact the small things can make on your child's development. I am managing so much better with being a mommy and what activities I can and can't do with my daughter. I have more knowledge about how my child is developing and I am aware of what I am doing and how it is affecting my child's development. It was wonderful - truly a special experience and I will recommend it to ALL mommies." “I am a very satisfied mommy and so fortunate to have experienced BabyGym. I would recommend this program to all parents. Thank you Anneri, and keep up the great work BabyGym! "This 5 week course has helped us to understand our baby's developmental needs. Our BabyGym Instructor, Lynette van Wyk, was incredible! Being a second time mom but a first time BabyGym parent she helped us to understand how we can use the BabyGym activities on our older toddler too. It has been a great bonding time for us as a family. Every parent should experience BabyGym!" "Nita is ongelooflik passievol oor BabaGim en dit kom oor in die manier hoe sy dit aanbied. Ek is ‘n 2de keer Mamma (het met 1ste kind ook BabaGim gedoen) en het weer vreeslik baie geleer!" "...My sister is pregnant so next year she will be joining you at BabyGym. I’m going to be sending her for BabyGym 1 and BabyGym 2. Zae is only so advanced because of the skills you have taught me. I appreciate you so much for that. You have no idea how many kids' lives you have changed - even those you have not seen. We need more like you in the world!" "My baby was 3 weeks old when we started BabyGym and before we started the program my baby seemed to be very stiff. As we started to massage and the days went by my son became more relaxed, sleeping patterns were developed as he would sleep longer hours and not be so restless as he was before we started the BabyGym programme. Such a lovely experience it was to witness how a small human can become so active through stimulation. Basically, because of BabyGym, a nappy change is now a challenge because my baby moves his hands and legs all over the place, BUT I love it! Lelani, our BabyGym Instructor, is extremely friendly and professional. She was always willing to give advice and answer all our questions to the best of her abilities. She is well equipped and provided a service that I'd rate 100%. I will definitely be attending all further classes from here on. We can't wait!" “Jill West was an amazing Instructor who made our BabyGym experience fun and very informative. Definitely a memorable experience with her. My daughter who is only 4 months old has already shown great improvement since we’ve started with BabyGym. I am very happy with this program. Keep it up BabyGym team!" "Like with my first child, BabyGym has been a wonderful and rewarding experience!" "Joanie was very friendly and accommodating, she made everyone feel welcome. I was impressed that she made the effort to know our names from the very first class. The BabyGym classes are informative and well structured. I loved the fact that you learn new ways and activities to bond with your baby - which are not only fun but also developmentally sound. Eliana and I thoroughly enjoyed the BabyGym experience, and continue to do so every day at home!" We had an amazing experience and thoroughly enjoyed all 5 of our BabyGym classes. Lyn is absolutely amazing and so good with all the little ones. Tate and I had loads of fun and learnt lots during our classes. Thank you, Lyn for being so kind and caring, and for sharing all your knowledge with us. We will definitely miss our weekly classes. “I would like to congratulate you on Karen, she is extremely knowledgeable, friendly and professional. She made so much effort to make us feel welcome and she took the most gorgeous photos of my baby during the classes. My baby and I enjoyed the BabyGym classes thoroughly and I will gladly refer any of my friends and family to Karen." A heartfelt note from an Ouma in the class: "Dear Liezl, I would like to thank you for making me feel so at home so that Lia and I could enjoy the BabyGym classes with you. I want to assure you that it was a wonderful experience and a great privilege that I could experience as a grandma and caregiver with you and Lia. I now understand the value of the BabyGym program for a child's development. My wish is that the BabyGym program will become so well-known, that every new mom or caregiver can be exposed to the knowledge to help their child reach every milestone and personal development. I will recommend BabyGym on my way forward because I believe that it is a GREAT investment towards my granddaughter’s future. Thank you for always being accommodating and patient with us." "We had fun learning new things to help my baby develop in the best possible way." "Lyn is an excellent BabyGym Instructor and I just loved learning the science behind the BabyGym activities." “We loved the BabyGym classes from the opportunity to meet other babies and their parents to the fact that we could attend as a family and all learn together. The structure of the classes covering a different topic each week gave us a chance to practice and incorporate the various elements learnt into Michael’s routine before adding more the next week. The tools we were given have made a huge difference to Michael’s development. A perfect example is how his core was not very strong, we started to do the exercises on the ball and 10 days later he is sitting on his own without any support. We also loved the opportunity to discuss questions and concerns we had with other parents and with Joanne. We are so sad the classes are over but are loving practicing and using all we learnt to ensure Michael has a balanced and well developed body and sense of self. Thanks for an amazing class! "Ons BabaGim 1 klassies was definitief oor en oor die moeite werd! Ons as paartjie het so baie geleer- van mamma en pappa se verskillende rolle, swangerskap, geboorte, baba-massering en selfs wat ons kan doen op baba se voeding en metabolisering te verbeter. Dit was baie interessant en ons sien uit na BabaGim 2!" Die BabaGim klassies was so interessant en leersaam! My dogtertjie het so baie ontwikkel in die 5 weke by BabaGim. Sy het begin deurslaap in die aande en begin rol. Dit is so 'n fantastiese ervaring vir 'n ouer as jou kind haar mylpale bereik, ongeag hoe klein. Madeleine is 'n uitstekende BabaGim Instrukteur en sy geniet wat sy doen. Sy kon haar eie ervaring met haar kinders gebruik en dit op die BabaGim inhoud prakties toepas. Dankie BabaGim! I found the BabyGym classes very informative and our Instructor, Kerry Kruuse, was really good. Would certainly recommend BabyGym to friends and family. BabyGym was the best decision I made for my baby. The improvement I saw and experienced with my baby is amazing! I am recommending BabyGym to all my friends and people I deal with. I do believe every baby should do BabyGym for their development. I'm looking forward to starting BabyGym 3 classes with my little one. Christine, you are absolutely amazing! We felt welcome and 'safe' in your classes from the very first day. Since starting BabyGym my baby and I have gotten to know one another better, we do more together, and we are working towards reaching his milestones in a fun way. Thank you for the opportunity to learn from you, and for sharing your passion with us. I will definitely recommend you to all my friends and their young babies. Baby Ethan also says thank you, he especially loves his BabyGym visual stimulation glove with all the colorful ribbons. Step by step, we continue to build Ethan’s brain! Aunty Zharina... I am so glad that I found out about you and BabyGym! I can’t tell you how much I enjoy learning from you. We look forward to every Wednesdays’ classes because you share your wealth of knowledge, your experiences and your insights with us every week. I leave your classes excited to try what I’ve learnt on both my boys, baby Rayyan and older brother Mizaan, and I look forward to the evenings to tell Daddy what we have done. Since starting your classes I have renewed energy to tackle the sleepless nights as I know the time will come when sleeplessness will be a thing of the past. I also leave your classes utterly grateful for my children, my blessings, and have learnt to complain less and appreciate more. I thank God for you and all you do. I am only sorry that I didn’t attend BabyGym with my firstborn, I will definitely be telling my friends and family to invest in their families, and enroll for BabyGym! Ek dink elke nuwe ouer moet BabaGim 1 klassies bywoon voor die nuwe babatjie kom. Dit het my en my man ongelooflik goed gedoen en rustig gemaak. Charlene was ook uitstekend en ons sien uit na ons BabaGim 2 klassies saam met ons nuwe babatjie. The BabyGym® exercises are very enjoyable, practical and make playtime so much more fun for mommy, daddy and baby. Ek het BabaGim vreeslik geniet en as mamma baie geleer ek kon alles op 'n maklike en effektiewe wyse by die huis toepas. Die BabaGim-program en ons BabaGim Instrukteur het my ongelooflik baie geleer. Ek voel as mamma het ek vir my kind die beste grondslag kon bied. Baie dankie vir 'n wonderlike effektiewe program en goed opgeleide Intrukteurs. Dankie aan ons Instrukteur ook vir haar toewyding tot ons kinders se ontwikkeling. Hi Melodie, ek is 'n oud-onderwyseres en Mamma, luister gereeld na Groeipyne op RSG en wil net sê dankie vir die LIEFDE wat uit jou stem straal, dit is so verrykend, meer as die kosbare inligting wat jy deel. Die inligting kom van "buite" maar die liefde in jou stem is so "eg". Today I had proof that the BabyGym Body Outline is not only for babies. My little boy, Peet, is four and a half years old. Since he started play school, I always rub his ears and outline his body before he goes to class. We call it "drawing your body", and when outlining 3 times, I always recite: "Mommy loves you, Daddy loves you, and Jesus loves you". Since his little brother was born I was instructed (by him) to do it four times, and to ad baby Nicolas into the mix. Yesterday was his first day back at school after the December holidays. I once again did our little routine, and afterwards, Peet had the biggest smile on his face. He started to walk towards the school, but turned around, ran to me and gave me a huge hug. He said: "Mommy, I love you very much. And we have to remember to draw my body EVERY day, not just when I go to school, because it makes me feel so nice. I know you love me Mommy!" And off he went to school, leaving me with a huge lump in my throat. I reached for little Nicolas' hand to go home, and low and behold, there he is, two years old, standing with his arms stretched out, saying: "Now it's my turn Mommy!" The BabyGym Body Outline has definitely created a special bond between me and my boys. In 2009 I attended antenatal classes and became friends with 2 ladies in the same class, all 3 of our babies were due in December 2009 but all 3 of us are educators and now that having a baby in January instead of in December is preferable, we were keeping our legs crossed! But it turned out all 3 of us had our babies very late in December. So needless to say we did BabyGym with the 3 December babies, and we really repeated all the exercises as much as possible and we had a BabyGym session once a week until we had to go back to work. Throughout the years we remained friends, our babies progressed together through sitting, crawling, teething, walking, talking and potty training and although we have all moved away we still share precious moments once or twice a week. Tomorrow, 14 January 2015, all three of them are going to Grade R. All three of them will be the youngest in their classes... But they are ready and I can't help to think that it must have been BabyGym! As a first time mom, I was quite unsure of how I would be able to creatively stimulate my baby girls development. I frankly felt out of depth because I did not know how to practically incorporate activities that would in future guarantee a successful learning career for my child. A friend asked if I would be interested in joining her in attending BabyGym with Zelna Bolton in Bloemfontein and I was very curious to hear and see what BabyGym was about. At first I was afraid that Arabella was still too young at 3 months but it was clear that BabyGym is essential for a child at any age. From the first class, my interest and mind was abuzz with excitement because BabyGym equipped me with the tools to take my daughters' development and future learning capabilities into my own hands. I confidently learnt to incorporate everyday activities into fun and wonderful developmental steps I could share with Arabella. This interaction further cemented our bond with laughter and curiosity. I was in awe at how Arabella's development occurred with natural ease and progression, just because of the incorporation of the massage techniques and activities I learnt from our BabyGym Instructor. I find myself eagerly anticipating our daily special time together, exploring and stimulating Arabella's interest and development in innovative and fun ways. I couldn't wait to share what a wonderful experience BabyGym was with my husband, Arabellas caregiver and all my friends who had their own little ones. BabyGym provides new parents with the perfect tools for building a wonderful relationship with your new baby and ensure that their future learning becomes a wonderful and successful learning adventure. The classes were excellent, the Instructor was able to come to my home for the classes and I have already recommended BabyGym to another friend. Hi Melodie, you are one in a zillion, your wisdom, your knowledge and resilient outstanding personality and outlook on life is inspiring, I am truly honored and blessed to have learnt so much from you in your training and your books. Thank you so much for your time and all that you do to help teachers and parents to bring out the best in our children. " Children are like wet concrete, whatever falls on them makes an impression." In 2010 I attended BabyGym with my baby girl and at the time my wife had severe post natal depression, and as part of my efforts as a father I used BabyGym to give our little girl extra stimulation she might have needed. It turned out to be very beneficial for her and we had a lot of fun. As the only male in the meetings I stood out a bit, but it turned out not to be a problem at all. We have recently had a little boy, and this time thank God, my wife is unaffected and doing great. We would love to attend BabyGym once again. I would just like to send an email to say thank you for such a wonderful BabyGym experience. Our Instructor was wonderful and she really helped me to understand my baby better, what to do and when to do it. My baby is a lot more relaxed and friendly since I started the BabyGym classes. I would like to thank the institute for training such a wonderful Instructor, she makes us feel at home and it's just such a great environment to be in, and no questions are ever too tiresome. Thank you so much for a great experience, my baby and I are enjoying every moment we spend in class. I have a personal success story to share. I was thinking some weeks ago that we do the nose and coccyx rotations in week 3 to assist metabolism and to allow what must go in to eventually come out. My son has stopped using nappies in the day and has been battling a little to get the poo out when on the toilet. One day I tried just rubbing his coccyx while he was on the toilet and 'voila' he had a much easier 'poo-ing' experience. Since then when I see he is struggling I rub his coccyx and it really does seem to help. If I do that he also manages to get it all out in one sitting and doesn't have to go again a few minutes after finishing the 1st time. Mike is 3 now so BabyGym it seems is not just for babies! He is also terrified of thunder and the vagus nerve rub works wonders to get him to calm down and go back to sleep if there is a storm at night. Thanks to Melodie for allowing us to learn so much and for us to be able to help so many other mums and babes including our own. As 'n ma wil jy net die beste vir jou kind gee en toe ons baba dogtertjie op amper 7 maande nog nie omrol nie en geen gewig op haar bene wou dra nie was ek bekommerd. Ek het geweet ek sal iets moet doen! Ek het gehoor van BabaGim by 'n opedag van Genesis Clinic en geweet dit is die beste opsie vir ons. Ons het die klasse begin bywoon en met die huiswerk oefeninge byna dadelik 'n verskil gesien. Elri het haar mylpale sommer gou begin bereik! Sy het 1 dag na sy ses maande oud geword het begin sit, op 9 maande begin kruip en 3 weke na haar eerste verjaarsdag geloop. Ek is baie bly ons het BabaGim gedoen, dit het 'n groot verskil gemaak! Ek dink my wang spiere was seer geglimlag na Woensdag se klas. Ek het dit vreeslik geniet om te kyk hoe lekker Arthur speel. Hy was SO in sy noppies! Baie baie dankie daarvoor! Ek het intussen ook 'n mandjie met wiele gekry en ons ry elke aand die huis plat 🙂 sy Pa kry ook die skoppelmaai mooi reg. Arthur is sommer eweskielik baie flink en fiks met sy omrol, dis so lekker om te sien. Ons sien uit om nog baie meer te leer! Sjenezke was 4 wekies prematuur en het reeds met BabaGim begin net 3 wekies na haar geboorte. Alhoewel sy baie kleiner was as die res van die babas in die klas het mamma baie toegewyd die oefeninge versigtig en gereeld herhaal. Reeds teen week 3 was daar al sterker nekspiertjies en na afloop van die 5 weke kon Sjenezke haar koppie al amper net so goed beheer soos n voltermyn baba. Hierdie was net weereens n bewys dat BabaGim regtig werk! Mommy Annika and baby Derik Papenfus (5 months) attended BabyGym in 2013. He was a very happy and healthy breastfed baby with no concerns. Mommy Annika was a first time mom and enjoyed motherhood tremendously. She however arrived on that particular day and was desperate- Derik refused to drink (for the 2nd day in a row) and although he was very hungry and restless, he refused to latch onto the breast. When he did latch, he would feed for only a few seconds and would pull away looking unhappy. She tried everything and considered all possibilities- her diet, her clothes, her fabric softener, her body lotion, his general health, changes in and around their home... she could not understand what the matter was, and was starting to consider a formula feed from a bottle. I was amazed that Derik's odd feeding behavior coincided with week 3 of the BabyGym programme, because in week 3 we focus on smell, taste and feeding- God's timing, I suppose! Annika did all week 3's BabyGym activities in class and one could see Derik becoming more and more frustrated, we were stimulating his suckling reflex after all! Mommy Annika was hesitant to put him on her breast as she was sure that he would just reject it again, BUT he latched beautifully and started to feed! In fact he kept on feeding for the remainder of the the class, which was 20 minutes. She was so surprised, and I was a little surprised too! Derik fed like a dream and was so satisfied that he fell asleep soon thereafter. When I checked in with them later that week he was still feeding very well and mom was a little more peaceful as she was now equipped with feeding exercises should they face a similar feeding challenge again. I enjoyed BabyGym as a first-time mother because it enabled me to stimulate and interact with my child in a meaningful way (without falling victim to baby consumerism in the sense of naively purchasing expensive contraptions that end up doing nothing for my child's development). I see my child becoming more complex by the day. She is an extremely confident little girl who enjoys physical activities such as Tummy Time far more than toys! BabyGym 1 also helped my partner and I to be more confident when our baby arrived. The 'I Love You' tummy massage was very successful when my daughter had to be fed on formula only 3 weeks after her birth. The BabyGym 3 Sitting Lesson has already helped a great deal. Ons het met BabaGim begin toe Marilet sewe weke oud was. Toe ek haar op vier maande vir die eerste keer skooltjie toe vat het die dame wat in beheer is van die baba klassie gesê dat sy, in die agt jaar wat sy babas oppas, nog nooit ‘n vier maande oue baba gesien het, wat so sterk is soos Marilet nie. Ek glo en weet dat dit te danke is aan BabaGim. So, ek wil dankie sê vir BabaGim en ons BabaGim Instrukteur wat my gehelp het om ‘n ferm grondslag te lê vir Marilet se ontwikkeling. Ek sal BabaGim beslis vir familie en vriende aanbeveel! Dit was n heerlike ervaring. Die geleentheid om ander mammas te ontmoet en selfs vriende te raak is fantasties. Ek is n nuwe mamma en hierdie inligting is van onskatbare waarde! Baie dankie dat julle die geleentheid skep vir ons om te leer. Baie oulik! Ek sal dit beslis vir enige iemand aanbeveel. Ons Instrukteur is puik. Baie dankie vir hierdie oulike program. Inge is my tweede kind en ek het nogsteeds SO baie geleer van ontwikkeling en die regte stimulasie. Inge se oppasser het ook baie baat gevind by die kursus, en ek kan sien sy verstaan die stimulasie wat ons maandeliks vir Inge uitwerk, en pas dit toe soos sy in die klas geleer het. Sy het veral die bal oefeninge en massering baie interessant gevind. I loved the class. I found that many of the things I learned for my baby I could adapt for my 4.5 year old. I'm proud to say that I have completed BabyGym with my boy (Janco, 20 months old) and was so pleased with the program that I am currently doing it again with my 2 month old baby girl (Milan). The Instructor was fantastic! The BabyGym experience has been wonderful for my baby, nanny and myself. We have now been made aware of the many ways to stimulate my baby both physically and emotionally. We are diligently doing the BabyGym dance and massage daily and my baby thoroughly enjoys it! Not only was the class fun but also very educational. Many thanks to our BabyGym Instructor for the kind support and encouragement. The classes were so enjoyable! BabyGym really worked for us, even his grannies are astonished at how well he is developing. My baby boy started crawling at around 6 months and walking at 10, I definitely think it's because of all the tummy time. He is a good sleeper, he has been sleeping through since 6 months, no hassles. I really believe that a lot of it has to do with the BabyGym firm foundation he received. He has done so well! I loved the course and found it really interesting and insightful, amazing how some of the things we instinctly do. The course helps to understand the role/ relevance of our instincts but certainly teaches you a multitude of things you just ordinarily would never have thought of or done for your baby!! We all loved the course thoroughly, Thomas never fell asleep once, just too exciting and entertaining! BabyGym showed me how to spend quality time with my child. It was a practical and useful course that opened my eyes to ways to interact with my child and have fun with him. It helped me understand that we all take in information in different ways. This understanding gives me tools to explore different ways to get my child to respond to stimulation in his environment and to me. My child enjoyed the time he spent in class and responded well to the exercises the Instructor taught us. The Instructor was a wonderful, warm person who created a lovely environment to learn. Highly recommended! When my little boy Patrik started crawling, he always crawled with his left leg out, in a 'ready to walk stance' (external rotation, abduction). Being a Physiotherapist I knew that for further development it was very important for him to crawl correctly (on all fours). Trying everything in my power and knowledge to get him to crawl correctly, I just couldn't get it right. So I contacted a friend of mine who I knew did BabyGym. Patrik and I went for a crawling class to Margit and she showed me a lot of exercise to do with him. The best tip for correcting the crawl was to crawl through a tunnel. We practiced a lot of crawling through the tunnel, the tunnel being narrow- he just couldn't put his leg out to the side and thus was forced to crawl correctly. I also did a lot of the cross-over exercises with him and after only 2 weeks he was crawling like a champion. Thanks to BabyGym , I now know that my little boy has perfected each development stage! Liewe BabaGim Instrukeur, hiermee wil ek jou bedank vir die wonderlike tyd wat ons by BabaGim gehad het. Dit was 'n kwaliteit ervaring saam my seuntjie Louis, ek en hy het dit vreeslik geniet! Dankie vir jou professionele diens en vriendelikheid. Ek het nooit geweet hoe belangrik dit is om van vroeg af jou baba se sintuie te stimuleer en dat dit die brein ontwikkel nie! Ek sal verseker toekomstige mammas na BabaGim verwys om die kennis op te doen wat ek by BabaGim opgedoen het. Jy het ons geleer om Louis te masseer en hy geniet dit vreeslik baie, hy ontspan en hy slaap sommer baie beter na 'n massering! Nou weet ek, ek en my baba is op die regte pad. Ons sien jou binnekort vir BabaGim 3 en ons sien vreeslik uit! Being a first time dad, like all other parents, I wanted the best for my little girl Zaakirah. At first I didnt know exactly what BabyGym was all about, but surprisingly a whole new window into the human mind and body was opened, and I learnt a lot! For me it was amazing to learn that seemingly insignificant or small things like perhaps eye contact or dad's touch are actually important factors in a child's development. As a dad I am relieved to have learnt that it is not the expensive toys and gadgets that will ultimately lead to the development of a better brain. Since doing BabyGym, we see Zaakirah as more calm, relaxed but still alert and active. My play time with her is now more structured and I know that when I do the stimulation with her it's more than just time spent with her, it is helping her to build a better brain! We say thank you to our BabyGym Instructor for a wonderful experience and truly believe that all parents and babies should have BabyGym on their to-do list! Thank you so much for the wonderful BabyGym course I completed with both my children (Sienna completed in June 2011 and Declan completed in March 2015). I found the course very interesting and useful and can definitely already see the result in Sienna. Die babamassering wat ek by BabaGim geleer het was van groot waarde vir my. Tydens die tweede week van BabaGim was my baba rustig genoeg dat ek die volle massering kon voltooi met hom, waar hy voorheen vir net n gedeelte van die massering sou stil lê. Die massering is ideaal om hom te kalmeer voor slapenstyd en help ook defnitief om winde te verlig. Dit was juis tydens BabaGim dat my baba begin kruip het en ek is van mening dat die massering bygedra het tot sy ligaamsbewuswording wat hom gedryf het om te begin kruip. My husband and I completed the BabyGym 2 program with our baby boy Arno. I recommend BabyGym to all new parents- it is incredible! The knowledge that you gain is so important to help give your child the best possible start in life and it's so much fun for the parents, and baby! We are incorporating the BabyGym activities into our daily lives and I can already see a major difference in Arno's development. My daughter, Emma, was born with a normal belly button. However, at around 4/5 weeks old her belly button popped up. I was told by the doctor that it was a little hernia where her muscles were not strong enough in this area and this caused the belly button to do this. I started attending BabyGym and our Instructor, Anneke Erasmus, suggested that I do the I Love You massage on her belly button on a regular basis. I did this every time I changed her nappy. Since then I have noticed a great improvement and her belly button has retracted a great deal. Emma is now 5 months old and this is how her belly button looks. It's a great improvement and I will definitely continue to massage her. Before BabyGym I only used to put Oliver on his tummy now and then and often kept him in a rocker seat during most of the day. After attending BabyGym classes I noticed just how weak he was during tummy time and how bad his posture was when he was sitting. After a week of constant massage and BabyGym exercises, Oliver showed major improvement. I've packed away the rocker seat and now have him play on the floor on a play mat- he seems so content and happy and is hardly in my arms. The massage is our favourite bonding time and Oliver now loves bath time, as this is when the massage takes place. Olivers reflux has also improved hugely since we've started BabyGym. Thanks to our Instructor, I will definitely be signing up for BabyGym 3! We started working with our BabyGym Instructor when I was 8 months pregnant, attending BabyGym 1. We were able to start with the massage from early on. The useful advice and information we obtained is incomparable with antenatal classes. From the onset our baby Ella was strong and well developed for her age. Each week we learned new techniques to develop the senses, even those that are not well known nevertheless exercised. We met sincere people, going through the same learning experience, who became our friends. Thanks to our BabyGym Instructor for helping to keep our precious little one happy, healthy and developing extraordinarily. Ek wil net graag dankie sê vir hierdie wonderlike program en ook aan ons Instrukteur wat die klasse puik aangebied het! Sy was so liefdevol en het ons ongelooflik baie gehelp. Ek het oor die 5 weke so groot verandering in my seun gesien en nou 2 weke later rol hy om van sy rug na sy maag en sit met min ondersteuning! Vandag is my 5 weke prematuur-babatjie al 5 maande oud en bereik al sy mylpale sonder enige probleme. So trots en so dankbaar vir die program! Baie dankie vir BabaGim, ek beveel jul vir almal aan! Your BabyGym® advice and insight has definitely had an impact on us as parents and on Kaley. Applying the principles we learned during the BabyGym classes we can definitely see the positive results thereof on Kaley's intellectual and physical development. Op 15 maande wou my seuntjie niks weet van loop nie. Hy het op twee verskillende geleenthede gewys dat hy wel kan loop, maar dit was asof hy net nie die moed gehad het om weer te probeer nie. Hy was bang vir alles en wou niks nuut probeer nie- heetsy kos, speelgoed of nuwe mense- hy het net geweier om te probeer. Op 15 maande het 'n 'goeie nag' beteken hy het 'net' 5 keer wakker geword. Meeste aande was hy tot 8 keer wakker. Die slapeloosheid het sy tol emosioneel en fisies geeis. Ek sien toe op Facebook van die BabaGim program en ek het dadelik met die naaste BabaGim Instrukteur kontak gemaak. Teen die derde sessie was my seuntjie 'n ander kind. Hy het onder andere saam geruik en selfs geproe aan dit wat ons voor hom neergesit het en sowaar- na ons weeklikse BabaGim klassie het hy opgestaan en geloop, so asof hy dit al vir maande lank doen! Dankie aan ons BabaGim Instrukteur en die BabaGim program, ek sien steeds daagliks hoe my kind ontwikkel en dit is als te danke aan julle program! Our daughter Charlotte was around 3 months old when we started BabyGym. I remember wondering what I was supposed to do with her between her meals and naps and BabyGym provided those answers. BabyGym helped me feel more confident and better equipped to handle my baby. I mostly loved the fact that I didn't have to find extra time in the day or extra money to do BabyGym with her. All the activities could be built-in to her daily activities and routine, like nappy changes and tummy-time and we could use things around the house like our washing basket and our towels. I felt so passionately about the BabyGym programme that I decided to leave the school classroom behind and become an Instructor. It is such a privilege to be on this journey with parents and babies. It is wonderful to be a parent, to have done the course as a mom and now to be teaching others parents! My baby boy, Levi, my husband and myself completed BabyGym 2 and would highly recommend it. Before returning back to work after maternity leave, I wanted to do something special with Levi that would benefit him and build our confidence as first time parents. Levi was 5 months old when we started BabyGym and it was amazing to see how he grew and developed and reached his milestones as best he could. Our instructor was passionate and knowledgeable. She created a welcoming and relaxed environment that made us feel more at ease when Levi cried! My husband and I feel empowered and more confident and we find ourselves building the techniques we learnt in class into our daily routine and play time. Thank you for the classes, we will definitely miss spending our Saturday mornings with BabyGym! It was abundantly clear that our BabyGym Instructor is deeply passionate about BabyGym and the benefits of BabyGym if parents apply themselves and make it part of Baby's daily life. I appreciated that our Instructor used her own experiences and related these to us. I felt extremely comfortable, welcome and at ease in her classes. Since my maternity leave is limited, bonding with my baby is extremely important to me. I felt that BabyGym gave me the tools to help my baby while I was bonding with him. It has given me confidence in handling him and I feel extremely motivated to continue with the exercises. I feel that I can already see results in terms of his neck control, alertness and curiosity. Mostly, BabyGym was just really fun and the fact that it has long term benefits is absolutely wonderful. My little Claudia loved her BabyGym! Firstly, it was great to socialise with other little babies. Mommy also learnt so much about how babies develop and what steps are important for development. It also gave me an opportunity to learn baby massage and this proved useful for us as a bonding experience before she began to wiggle too much. I also taught Claudia's nanny some lessons and they had fun with that. Our BabyGym Instructor was excellent, so patient and she expressed such genuine care for our babies. We thoroughly enjoyed BabyGym and we think all babies should attend these classes! Our beautiful little Lente graduated today! We have learnt so much in such a short time and I am proud to say that my little girl is part of your institution. Thank you BabyGym. I would like to thank you from the bottom of our hearts for this amazing experience with our baby baby girl! BabyGym has helped us to read and understand our baby and this has been very valuable to us as first time parents. BabyGym has encouraged my husband to play and interact with our little girl and I have learnt the importance of small everyday activities that are so crucial for development. Thank you to our BabyGym Instructor, we really loved the whole experience. 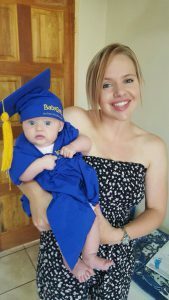 You are an amazing teacher and seeing you with your baby really showed us what an amazing mother you are! I would just like to say a big thank to our BabyGym Instructor as she truly went out of her way and gave up her extra time to assist my little boy, then 4 months. During the BabyGym 5 week programme I noticed that he wasn't reacting like all the other babies in class. He wasn't turning his head, following the sounds and at home family and friends were questioning whether he could hear. This had caused some panic! I instantly made an appointment with an Otologist, where certain tests would be done within a 2 week period. Our BabyGym Instructor stayed in contact and suggested that we carry on with lots of BabyGym homework as she was determined my little one would improve. The first round of tests were done but nothing seemed to be wrong. Whilst waiting for the next scheduled test we carried on with BabyGym extensively and started seeing a change in my little boy. Slowly but surely there were signs that he was responding and improving! I was over the moon and I couldn't believe that in only 2 weeks my little boy was responding to all the sounds and was more alert than ever. I am sincerely grateful to our Instructor, her assistance and the existence of BabyGym- I will always recommend it! Our BabyGym Instructor was awesome to "work" with and such a pleasant and helpful person! I would highly recommend BabyGym with her to all my friends. I was concerned about my daughter, Emma, and her milestones but our BabyGym Instructor was wonderful- very helpful, understanding and accommodating. I have learnt so much from her and as a result, Emma is flourishing! After 9 long years of waiting for our little miracle, he was impatient to meet us and decided to make an appearance 2 months ahead of schedule. The weeks that followed were spent holding vigil in a neonatal ICU, where we were told that as a preemie he would in all likelihood be behind schedule in reaching his development milestones. Given Kian's tumultuous entry into the world we were committed to supporting him in achieving these milestones with minimal upheaval. Preliminary internet research and listening to the experiences of a few fellow mums suggested that BabyGym was an avenue worth exploring. We took a punt and it paid off... As early as the first lesson we saw a change in Kian. The positive stimulation meant that he was more attentive than he'd ever been. The baby massage techniques we learned supported him in becoming more mobile and consequently more agile. Moreover the classes and the weekly "homework" meant that we were engaged in valuable quality time as a family. As first time parents this was essential in establishing both a daily regimen and a sustainable home dynamic. It's been some weeks since Kian's graduation but this hasn't halted our BabyGym journey. All three of us continue undertaking the prescribed exercises with gusto, and we're delighted by the engaged, bright and personable little boy that Kian is becoming. My husband and I are in agreement that BabyGym was a worthwhile investment. We're proud by the developmental strides Kian has made and would happily advocate the program to other parents. Both Max and I thoroughly enjoyed our BabyGym sessions. It was great to structure our playtime and give practical instructions to our nanny so Max's development is optimised (even when I'm not there) as well as keeping him optimally entertained and happy. I absolutely loved this course. Being a mother for the first time is a scary thing but attending these classes helped me to work more confidently with my baby and in such a way help her develop. Our BabyGym Instructor was amazing and it was great to see how passionate she is about BabyGym! LOVE HER! I am so glad I came across BabyGym and that I was able to complete it and spend some fun and quality time with my little one. I also find the course affordable and receiving the notes afterwards is also a big help. Thank you BabyGym for the wonderful insight and information! It is going to make a huge difference in my and my baby's life! Please keep up the great work! I am a huge fan! The information I have learnt through taking part in BabyGym is invaluable. There are reasons for even the smallest and seemingly inconsequential milestones our little miracles reach on a daily basis. Overlooking these achievements or negating the importance of them certainly does not add to the development of our babies. Embracing certain simple techniques by understanding the body ingenious way of growing and developing has certainly given me peace of mind in knowing that I have given my special Blair an advantage in a scary start to life! My daughter and I absolutely loved BabyGym. It exceeded my expectations completely - not only learning activities to do with baby at home but also the reason why we do these activities and how it will help to develop my little one to her fullest potential. Our BabyGym Instructor was amazing!! And 5 weeks was not enough! I wish it was longer. Wat 'n absolute plesier! Ek en my man het 'n BabaGim1 klas bygewoon en dit was 'n heerlike ervaring! Dit vat ook so bietjie die angstigheid weg wat mens het omdat mens nie heeltemal weet wat om met 'n eerste baba te verwag nie. En voila! BabaGim werk! Ek voel my baba seuntjie het beslis 'n voorsprong in die lewe omdat ek direk na geboorte met die massering begin het. Ook help die kalmerings- en borsvoed tegnieke onmenslik baie! Baie baie dankie aan ons Instrukteur, Cozette Laubser, wat vir ons die klas aangebied het, ons is oneindig dankbaar vir jou. En dankie BabaGim, jou lekker ding! BabaGim 2 klasse sien ons beslis binnekort! My man het vir Rudine Ferreira, ons naaste BabaGim Instrukteur, inderhaas en moedeloos gebel om te smeek vir hulp, beide ma en sussie was goed in trane. Ons het ons eerste konsultasie bespreek en gebid dat dit die regte ding sal wees. Min het ons geweet dat hierdie besluit juis ons en ons pragtige dogtertjie se lewe sou verander. Met ons eerste besoek het Rudine soveel insig gegee oor wat ons verwagtinge moet wees en hoe mens jou lewe beter kan beplan. Ons het geleer hoe haar brein werk en ook dat mens talle dinge kan doen om haar leerproses te verryk. Ek het geleer om Zarike te masseer en so tussen al die huil en baklei deur, het ons stadig op die regte paadjie gekom. Tydens ons eerste besoek kon ons dogtertjie nog nie op haar eie regop-sit nie. Met ons aankoms tuis het ek dit wat Rudine vir my geleer het herhaal en binne sekondes was daar 'n groot verskil, my kind was 'n engel! Sy het daardie selfde dag 2 ure in die middag geslaap, sonder 'n geluidjie- en slaap was van daar af ook nie meer 'n probleem nie. Ons is 2 weke later terug vir nog 'n klas en toe kon sussie reeds self regop-sit. Binne 'n maand het my kind geleer om te sit, self van lê af regop te sit en ook te begin kruip. Ons kon ook meer oomblikke van rus en stilte beleef, omdat sy meer tevrede en gelukkig was. Zarike kruip nou voluit, en trek haarself teen absoluut alles op. Te danke aan Rudine en die BabaGim klasse, kan ek vandag met 'n geruste hart sê dat ek die kind het waarvan ek nog altyd gedroom het, selfs nog voor sy daar was. Ek loop elke dag en vertel hoe BabaGim, en ons ontmoeting met Rudine, ons lewens en veral Zarike se lewe, verander het. Met baie dankbaarheid in my hart, weet ek ook nou ek is 'n goeie mamma.